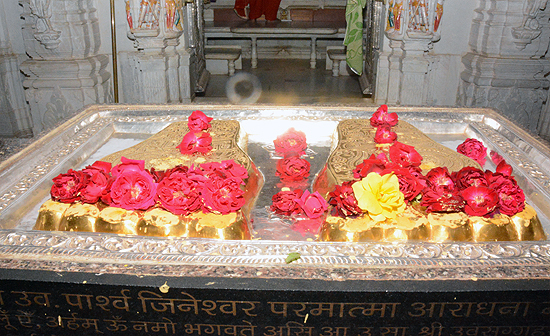 The presence of very ancient shrine on whose threshold (DEHRI) stood the pious footprints of Parshwa- Prabhu was mutilated by the impact of time. It was rusty maroon coloured and dilapidated. As the luck would have it, an eminent man of letters. journalist, and scholar Shri Rawalmalji Jain 'Mani' traced them out and got them renovated with the help of devotee friends. He was destined to play the role of a pioneer in making the dream of a Jain,- shrine, a reality. Presently positioned on the right side of the first pedestal or step of the main temple, the foot - prints of the Lord are the first object of worship and homage.